Clearly the company above isn’t. 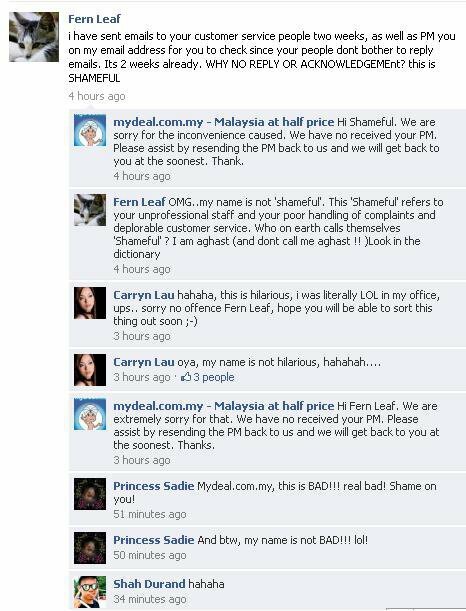 Sure they are responding quickly to the complain but addressing the customer wrongly takes away the merit – especially calling him / her “shameful”. Good thing the company spotted the error and apologized not too long after but that has remained as a joke in Malaysia for days. What Can You Learn Out Of This? #1: Double and triple check before posting. I know most companies have a standard template reply and have grown to use them a bit too much resulting in simple errors such as inconsistency in addressing the customer’s name or in situations such as the above. #2: Train your staff / social media manager. This may sound like common sense but from what happened above, there IS a possibility that the person you’ve put in-charge may not know their way around the tool (in this case, Facebook) well. #3: Know your language. I’ve to admit that not everyone may be excellent in English, especially when it comes to writing but know this – if your audience is proficient in English, make sure your employees are proficient in English;likewise for any other languages be it Chinese, French, Spanish or Arabic. #4: Don’t respond for the sake of responding. Are you sure that post / comment / feedback meant what you think it is saying? Are you making assumptions? Responding on social media platforms have a major advantage – time. Unlike over the phone where conversations become awkward if you take too long to reply, you can afford to take some time to read, re-read AND re-read to make sure you’re getting it right before responding. #5: Admit your mistake and make up for it. Although it has already become a joke, it is important for you to own up to your mistakes and not to sweep them under the mat. NEVER delete them to cover your tracks. Accept it, respond to it positively and do not let the jokes bother you too much. Lesson learnt!